I’ve got to ask you something a bit personal. But… the “when” of my question might seem a bit… off. were never able to do… to have… to accomplish. 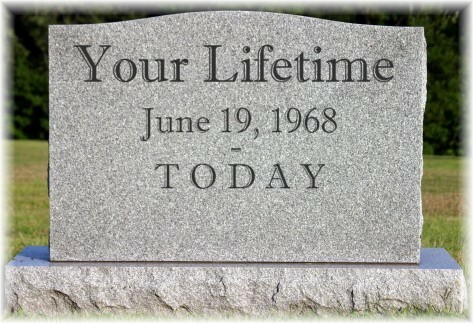 on the last day of your life. chills run down my spine. No time for that. Onward. this was personal – I wasn’t kidding. This is way more personal than you know. Good thing I’m among friends. and tomorrow finds us no more. What price would you have paid for it? To what ends would you go and to what extent? What would you give up – what would you sacrifice? To what places would you go, travels would you venture? only seemed a sacrifice at the time. and what you accepted as “good enough” for your Life. I want you to lose sleep over this. HOW CLOSE THEY ARE… then so are you! a good hard look at what I just said. You do not know when your finest hour is until it is. the difference in the world until after it happens. might have had will be far too high a price to pay? here at what is your final day. Don’t forget – that’s where we are. to go back and do it over again. the past that has yet to be created. life and the direction it will go and flow. blessings that surround us every day. does not mean they don’t exist. out of YOUR sight – out of your vision. your vision will always be lacking. Don’t nod if you don’t. Life and those who share it with us. and that you deserve it. time and time again in hopes it sinks in. most of us give up and in too soon and play small. We don’t ask for more, and we expect so much less. for the gusto & drinking deeply. things that they’ve shared they really want. man (or woman) in the mirror. Do you know what circumstances are ? on the Journey of your dreams? Are you just going to give up on them? wasn’t meant to be, and let the dreams die? that is convenient and easy? with your current situation and familiarity. ambitions for mere security and comfort? Will you boast that you took the easy path? I want you to seriously think about this. you have tuning out your deeper realms of thought. and you only have one of them. realizes that they wasted it away. as if they were merely toys and trinkets. and pulls you out of your “settled for” Life. is that YOU aren’t worth it. Listen To Your Self	WHAT IF you gave your all?